Mitch Blair serves as Vice Chairman of the firm; he is a former Chair of Calfee's Litigation practice and he leads the Securities Litigation practice. He litigates and tries complex disputes, with special emphasis on securities and derivative litigation and enforcement. As Vice Chairman, Mitch helps manage and support many of the Firm’s most significant clients. He oversees major projects to ensure appropriate resources are dedicated to addressing clients' needs and to provide clear communication and reporting. He also helps lead the firm’s efforts in developing new and expanded client relationships. Mitch joined Calfee in 1982. He became a partner in 1990, a member of the Executive Committee in 2003, and a member of the Management Committee in 2009. 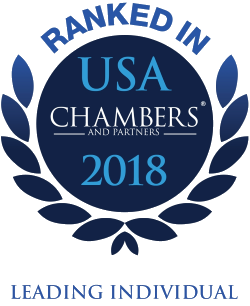 Chambers USA 2018 researchers note that Mitch Blair's clients described him as a "bright and tough guy who gets straight to the point;” he is known for his “incredible analytical skills” and his “great oratory and litigation skills in the courtroom;" Mitch is "confident, well prepared and able to think on his feet;" and he has "outstanding trial skills but also excels in his early assessment of cases, which gives clients a realistic perspective of their prospects in pending litigation." Particularly successful in defending clients before juries, Mitch has won cases in federal and state courts on behalf of plaintiffs and defendants involving business disputes, including class and derivative action defense and SEC FCPA and accounting-based enforcement actions. Mitch has a track record of successfully representing corporations and individuals in high-stakes litigation. Mitch represented one of the nation’s largest utilities in a multi-million-dollar breach of contract dispute, achieving a settlement worth $200 million to the client. Recently, Mitch led a trial team that obtained a multi-million-dollar judgment for an international tire company. Mitch has extensive experience representing directors of some of the region's largest companies in shareholder derivative litigation. Mitch Blair is described by clients as a "bright and tough guy who gets straight to the point;” he is known for his “incredible analytical skills” and his “great oratory and litigation skills in the courtroom;" Mitch is "confident, well prepared and able to think on his feet;" and he has "outstanding trial skills but also excels in his early assessment of cases, which gives clients a realistic perspective of their prospects in pending litigation."